When logging to influxdb the logger uses the Python bindings for the NVIDIA Management Library (NVML) which is a C-based API used for monitoring NVIDIA GPU devices. The performance of NVML is better and more efficient when compared to using nvidia-smi leading to a higher sampling frequency of the measurements. For now I recommend the -e flag since it is in active development and will be easy to update by pulling the latest changes from the repo. You can also run it straight from a docker image (masalvar_gpumon). To do this you need to set up and install InfluxDB and Grafana. 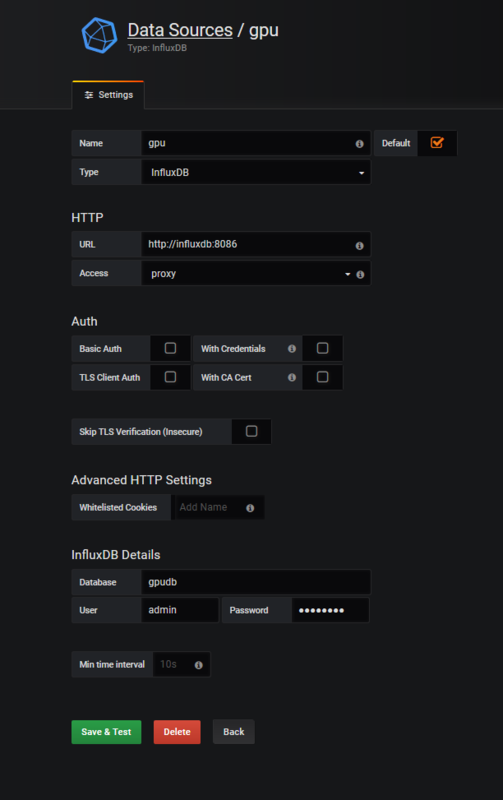 There are many ways to install and run InfluxDB and Grafana in this example we will be using Docker containers and docker-compose. Please change them to appropriate values. The data location entries (GRAFANA_DATA_LOCATION, INFLUXDB_DATA_LOCATION) will tell Grafana and InfluxDB where to store their data so that when the containers are destroyed the data remains. Once you have edited it rename example.env to .env. Now inside the folder that contains the file you can run the command below and it will give you the various commands you can execute. Make sure you replace the values in the call to the log_context with the appropriate values. gpudata is the name of the database and gpuseries is the name we have given to our series, feel free to change these. If the database name given in the context isn't the same as the one supplied in the .env file a new database will be created. Have a look at this notebook for a full example. By default a datasource and dashboard are set up for you if everything went well above GPU metrics should be flowing to your database. You can log in to Grafana by pointing a browser to the IP of your VM or computer on port 3000. If you are executing on a VM make sure that port is open. Once there log in with the credentials you specified in your .env file. Once that is set up you will need to also set up your dashboard. The dashboard shown in the gif above can be found here and is installed by default.